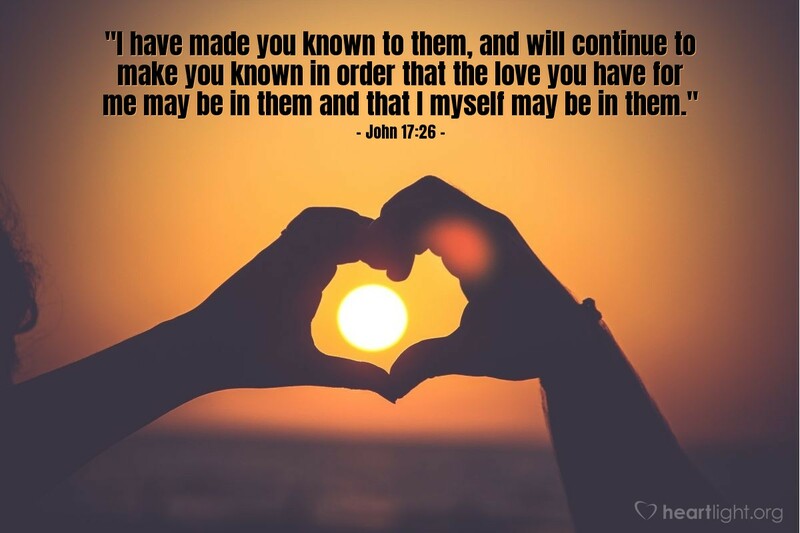 "I have made you known to them, and will continue to make you known in order that the love you have for me may be in them and that I myself may be in them." Jesus reveals God to us. One of the reasons he does this is so that we can know who God is and what is important to him. Clearly, the most important thing on Jesus' heart in this prayer is that we share his love for us with each other. In this way, Jesus comes to life in us. Almighty God and loving Father, please fill me with your love for my brothers and sisters in Christ. I want to honor you in the way I treat them and share the love of Christ in the way I interact with them. Please bless me as I seek to be a more gracious child of your love. In Jesus' name. Amen.